I didn't even know they had coloured vinyl in the 70's?! It seems that there’s never been as much traffic in our synth blog as in the last few days. The Roland Rap proved to be a very succesful track among people from all walks of life. Well, I kind of like it when our blog has a lot of traffic. That’s why I wrote this post. Last night I was arranging my 7″ singles which had been lying on the floor since my last dj gig. I did some maths and came up with figures around 1600-1800. That’s the amount of 7″ singles that I have in my collection. Quite a lot, I’d say. There are a lot of obscure 70’s and 80’s disco and synth tracks from all around the world, but to my tastes the finns did by far the best disco. This particular track is a “home made” cover of Dee D. Jackson‘s great Automatic Lover hit. 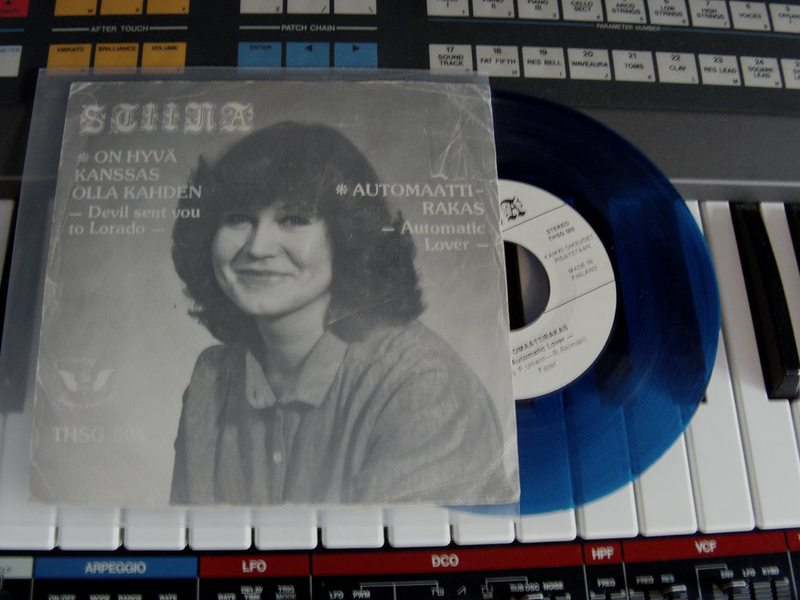 It features a throbbing Moroder -style sequenced bass and because in Finland there apparently were no vocoders in 1979, the parts that originally were vocoded to sound like a robot speaking, are just some guy talking in a monotonous tone. That’s finnish hi tech disco for you. A stand out synth track from finnish musical history that’s been hidden for way too long. (If I remember correctly, I bought this one from a yard sale for 0,5 euros.) The cover is amazing too with the name of the artist written in “gothic” black letter font and the vinyl really is transparent blue. That’s some ….psychedelic stuff. I feel like I’m in the future just by listening to it.